Chris Gutierrez and Juliana Suarez direct traffic and maintain order. For the second year in a row, DATA students volunteered their time to help teach the importance of science, math, and engineering to younger students between the ages of 9 and 14. DATA students spent two full days, November 2 at the Palm Springs Air Museum and November 16 at Desert Mirage High School, working in a variety of positions at a qualifying tournament for First Lego League through SMaRT Education. Their specific job duties were only a small part of the day. Aside from helping to organize, maintain, and manage the event, DATA students acted as positive role models for the younger event participants, creating a genuine bond and helping to build excitement. Thank you to all who volunteered! First Lego League helps to engage young students in science, engineering, and math by providing fun, real-world experience with the subjects, and we are proud that our students are willing to give so generously of their time! 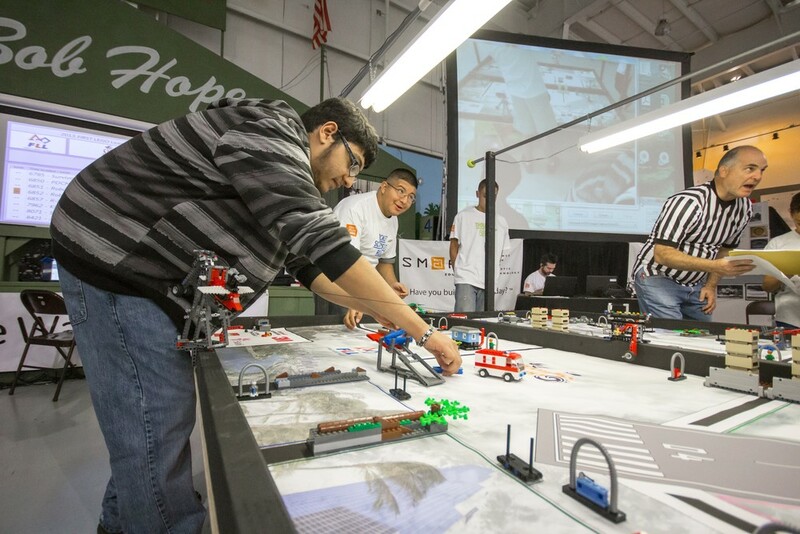 Jose Bermudez and Alan Cabrera reset a competition table for a Lego robot tournament.